2016-05-07 At the flying field today with my son I wanted to get this Spitfire back in the air. So I "gassed" it up, turned on the transmitter and then the plane and NOTHING!. Frustrating as I had it running just a few days ago in my driveway to tune the engine and make sure it was ready to go. I use Spektrum gear so tried to rebind it. Nothing. The light on the receiver, a Spektrum AR400, didn't glow or flash or anything. So I un-fueled it, flew something else and came home. I had a spare Orange receiver (I don't recall which one but it was an 8 channel one) so plugged connected it in place of the AR400 and bingo, everything worked! Somehow the receiver was dead. I may have killed it messing around charging the plane battery. The switch-charging jack seems very hard to get a charge plug to fit and once or twice my charger reported a voltage of about 15 volts before issuing a "break" warning. Perhaps that over-voltage spike took out the receiver? Anyway it is now ready to head to the flying field once more. 5/27/15 A couple days ago I decided it was time to get this plane ready for the 2015 flying season. Looking it over I discovered that one aileron servo was slipping. Further investigation revealed that the reason it was slipping was that the little screw that holds the arm on was too small and so the arm wasn't fully seated on its gear (or whatever you call it). Glad I caught that before flying it as that aileron could have easily gotten stuck in some awkward position making the plane difficult to fly, if at all! So all that's left is to fire it up, tune the engine and take it out to the field. 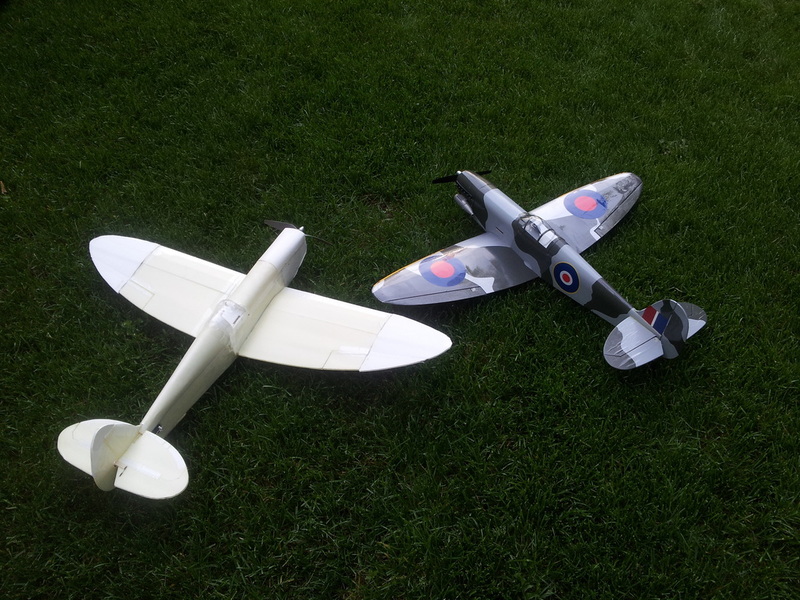 One of the FliteTest Dollar Tree foam board planes I built was their Spitfire (the white one on the left above). It has been through the ringer but is still flying. It is a lot of fun. As a result I fell in love with the Spitfire. So when I noticed that Great Planes has a 39" wingspan Spitfire ARF plane (on the right above) I couldn't resist. It specifies a .25 engine so I bought off eBay an old Brat .25 engine. On the first flight it took off well, a bit squirrely as I tried to figure out its control personality. Turns were really tricky taking a lot of coordination between rudder and ailerons. It also was VERY fast! So unfortunately after a 180 degree turn and pass over the field it got away from me and down it went into the trees. We trudged around and found it about 35 feet up in the tree in a swampy area in the tree farm where our flying field is located! Amazingly it went right into a fork with almost no damage to the fuselage and challenging but non-structural damage to the leading edge of the wings. The propeller wasn't even damaged! That was several weeks ago. Today (6/14/14) I took it out to our flying field and my son flew it. He got it back safely but said it was quite a hand full! No wonder my attempt ended in the trees! He thinks we need to mix the ailerons and rudder to make it a little easier to handle. It clearly isn't a beginner's plane, but then what do you expect from a WWII fighter! 6/27/14 Took the Spitfire to Bong State Recreational area where they have a paved RC airstrip. Had a nice flight with it. It is a very fast plane and glad my son was there to talk me out of a problem with the first turn. It got far enough away that I wasn't sure about orientation. I mixed the ailerons and rudder, got it trimmed out and it flies really well. A young man on break from college was there and got these photos. It's a sharp looking and fun little plane. And it certainly will never rust as that little engine pours out lots of greasy, unburned fuel. I'm thinking it is not the worlds most efficient .25 cu. in. 2 stroke.